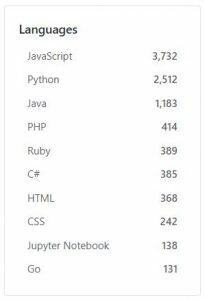 This 100 item list represents a search of github for “chatbot”, Nov 2017.
irazasyed/telegram-bot-sdk ? telegram bot api php sdk. lets you build telegram bots easily! supports laravel out of the box. dcsan/gitterbot gitterbot / gitter chatbot with wiki integration, and more! looker/lookerbot lookerbot lets you access all your looker data from slack! super fun! charcoal-se/smokedetector headless chatbot that detects spam and posts links to it to chatrooms for quick deletion. inikdom/neural-chatbot a chatbot based on seq2seq architecture done with tensorflow. broidhq/integrations connect your app to multiple messaging channels with the w3c open standard. awslabs/aws-serverless-chatbot-sample reference code for running a slack chatbot using aws lambda and amazon api gateway. qiscus/qiscus-sdk-android qiscus provide everything you need to power up your app with chats. and it’s now made simple. jinfagang/pytorch_chatbot a marvelous chatbot implement using pytorch. messenger4j/messenger4j a java library for building chatbots on the facebook messenger platform – easy and fast. litaio/lita-hipchat a hipchat adapter for lita.